We encourage people to use a near infrared sauna on a daily basis to help the body eliminate toxins and warm the core of the body. We've found proponents of both near and far infrared saunas, and spent hours researching before being convinced about the value of near infrared, which is easy and inexpensive for you to buy and build for yourself. The short answer to what we found is that near infrared does seem to penetrate tissue better (despite claims by both sides) and isn't blocked by water the way far infrared is. Read this article if you want the details we explored. Now, if you're ready to build an infrared sauna for yourself and you're ready to learn how, read on! If you do not have a small room to build a sauna in, or you simply prefer to buy a sauna, we recommend this high-quality near-infrared sauna option. It comes HIGHLY rated by its customers and is hypoallergenic for those who are sensitive to off-gassing. Or follow the details below to build your own near-infrared sauna! Whatever you do for the enclosure, make sure it's not built of flammable materials and that you keep flammable materials out of the sauna. Make sure you have room for the lamps and about two feet of space between your body and the lamps. You want to find a comfortable distance so your skin doesn't feel like its burning and yet you're warming up enough for a good sweat. 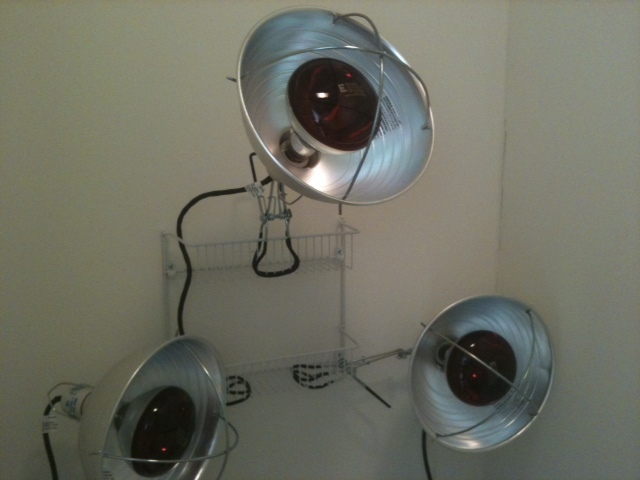 First you will need three 250 watt heat lamps. You can buy these bulbs at your local Home Depot, Lowes, or possibly other hardware store, or simply buy them through Amazon. We recommend Philips, but any will do. ​When handling your infrared bulbs, it's best not to touch them even when they're not hot, as this can leave body oils on the lamps and shorten their lives. Use gloves when installing them. NEVER GET WATER ON HOT BULBS!!! ​​Next you need to buy something that can safely run the bulbs without creating a fire hazard. That's why we recommend correctly rated clamp lamps. Look for those rated for 300 watts. Again, buy them locally or here on Amazon. Here's a page that shows you how to put the clamp lamps together. Now you just need a place in your enclosure for clamping the lamps. If you don't already have a shelf or something handy, you might consider buying a simple wire rack as we did. We used a rack with two shelves so we could have the lamps at three heights to cover more of the body, and we like shelves with both vertical and horizontal surfaces for flexibility. We got this at Home Depot. We couldn't find an exact match on Amazon, but you could get 2 of these. Make sure the lamp shade and lamp don't touch the rack, as they will get hot. Want to keep everything simple and portable? As long as you have room in your enclosure, here are two lamp systems that will meet your needs. One has 5 x 150 watt lamps and one has 3 x 250 watt lamps (both a total of 750 lamps). ​You only need ONE of these. 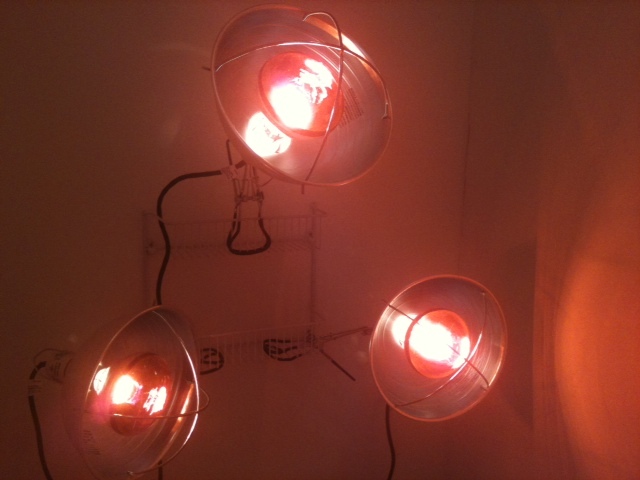 The one with 5 lamps has some reviews that talk about its instability; people have addressed this with tape (to the floor) or probably extra weights on the back leg. We wonder if positioning the heads back a bit would help. Make sure that you use common sense if building your sauna in a bathroom. Use a power strip that can trip a circuit, and turn off the power strip when not using the sauna. Keep electricity away from sinks and showers. Also make sure you are physically fit to use a sauna and remain in elevated temperatures. Consult your doctor if you have any questions. Do not ever look at the lights when they're turned on. Keep your eyes closed if facing the lights and, better yet, consider using tanning goggles. Depending on the size of your sauna, you may need a heater in your sauna in addition to the lamps. This allows you to heat it up more quickly to help with the sweating process. If you build or buy a small sauna, however, these shouldn't be necessary. Many heaters can run at 750 watts or less, so that when you run this along with the lamps, you're running 1500 watts -- similar to a hair dryer or a heater set on high. Here's a low-cost option if you don't already have a small heater. Please note that running more wattage at a time may trip circuits, so if you buy a heater make sure it can run at 750 watts or less. Using the heater and lamps together, get the temperature up to around 100 degrees before you enter your sauna. Use a thermometer to track temperature. Most people can safely stand temperatures up to 120 or even 130, but you'll probably be able to get in a good 20 to 30 minute sweat before it reaches 120. You may wish to stand on a floor mat that you can clean, since you will end up dripping a lot of sweat on the floor. Either this or have something to clean your tile floor later. If you have easy access to your shower afterward, this will help you keep things clean, and you can slowly bring down your temperature in the warm water. Remember to turn off the sauna's electrical power before you turn on the shower. We hope you'll use your sauna several times a week or even daily. It's a great way to slow down, meditate, or catch up on reading, and truly promotes health in your body. Happy saunas! Useful for those who need other options, but please note that these all appear to use far infrared (FIR).